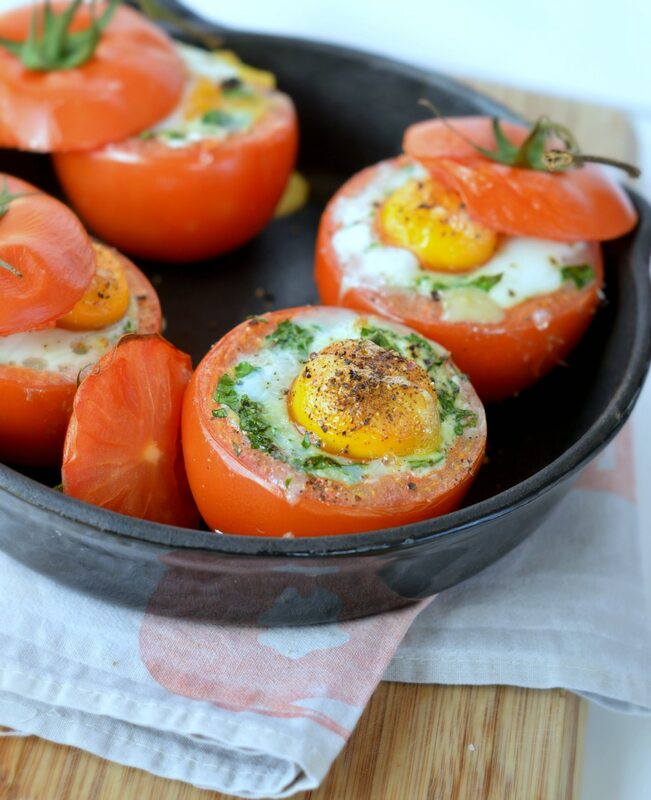 Egg Stuffed Tomatoes with Spinach I love you ! Don’t you think that eggs, tomatoes & spinach are a killer breakfast combo ? I really do love this trio of flavor even better if it is easy to make and topped with mashed avocado ! Ahh this pregnancy turns me into a different woman. I am now eating savory breakfast – which I never appreciated before – and I must tell those egg stuffed tomatoes and my zucchini parmesan waffles recipe are my two favorite quick breakfast recipe right now. I love it because all I have to do is cracking an egg in a tomato hole and bake the whole thing for 15 minutes! DONE! Of course, it taste better if you add some extra flavor and toppings and today I am sharing with you my favorite recipe. Egg stuffed tomatoes with spinach, coconut cream, tiny bit of grated cheddar and mashed avocado on top. Well, if you love spicy food like I do add a drizzle of sriracha sauce on top and you just made the BEST savory breakfast ever! This is basically all the 5 ingredients you need to make this simple and delicious egg breakfast recipe. Oh and if you don’t eat dairy you can remove the cheese it will work like magic too! 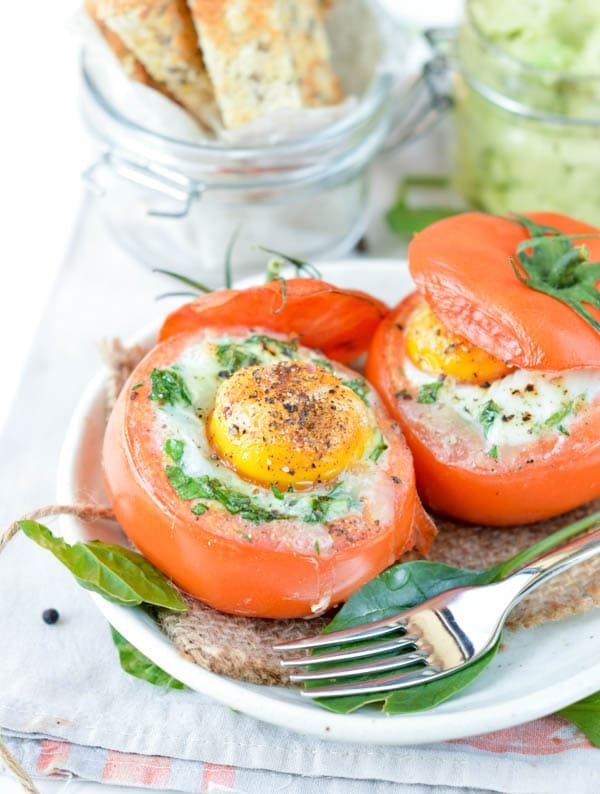 The trick is to make perfect egg stuffed tomatoes is to cut the top part of the tomato thinly and to dig a hole inside the tomato – removing all the flesh and seeds carefully with a spoon until no more liquid is left. Be careful, don’t dig to hard or you will break the bottom of the tomatoes! Now, you are ready to stuff the tomatoes with the ingredients you like or follow my favorite recipe below – highly recommended of course ahaha! As my husband and little one don’t enjoy savory breakfast I prepare more tomatoes for them for dinner. It stores very well in the fridge if you make them ahead – even the night before breakfast of course crack the egg only few minutes before baking the tomatoes to avoid the eggs to dry out. When they eat those egg stuffed tomatoes for dinner I cook them in a greased skillet and I serve them with cooked quinoa or millet as a side. For breakfast, this pair well with my green smoothie recipe. 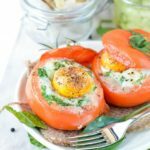 Really, if you are always on a rush in the morning but you like to fuel up with an healthy savory breakfast you must try this recipe. And it is low carb too ! Enjoy and bon appetit bien sur ! I baked my tomatoes into this 12.5 inches skillet, I found it bake fester than using a ceramic dish plus it crisp the bottom of the tomato skin, delicious ! 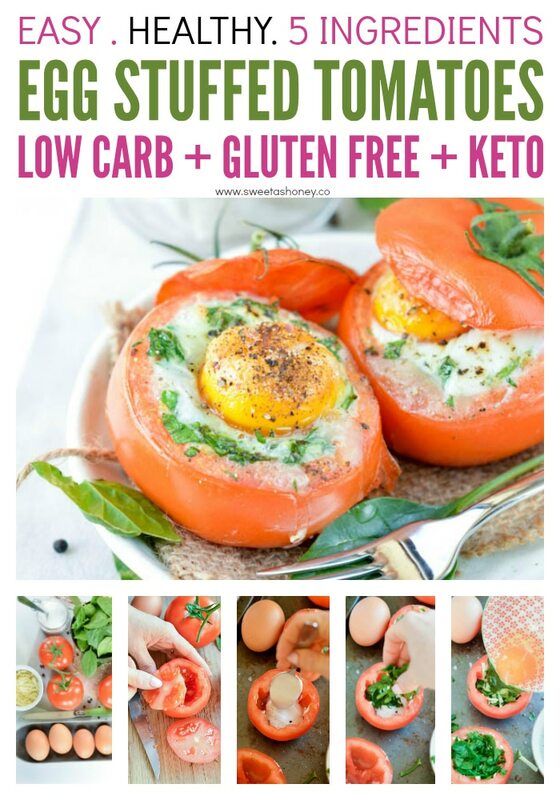 Low carb egg stuffed tomatoes with spinach and cheese. Delicious dinners or healthy breakfast recipes 100% gluten free and keto friendly. Grease a oven proof baking dish with a little bit of vegetable oil. Set aside. 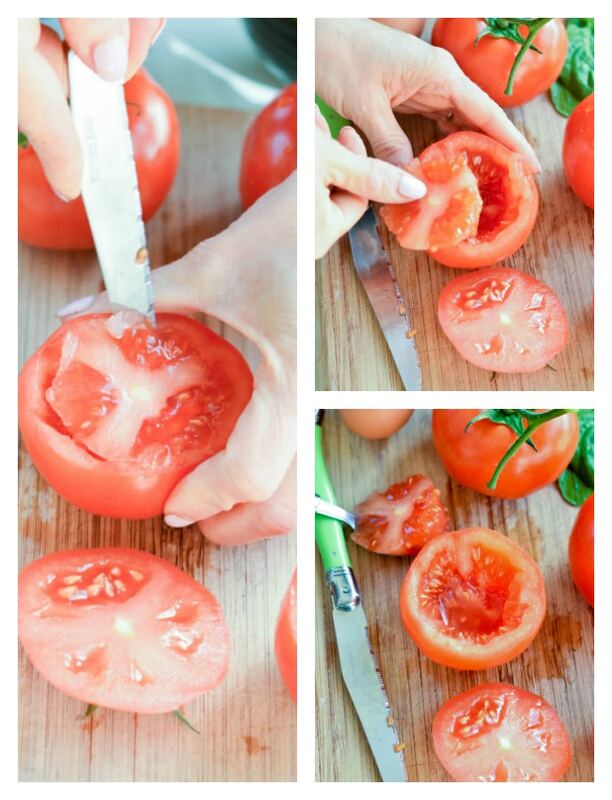 With a sharp knife, cut the top of the tomatoes and using a spoon remove the flesh of the tomatoes. Be careful, don't break the bottom of the tomatoes. Discard the flesh - juice and seeds - or keep for a tomato soup. Repeat for each tomatoes and place them onto the oven proof baking dish leaving half thumb space between each tomatoes. Add 1 teaspoon of coconut cream at the bottom of each tomato hole then add chopped baby spinach, grated cheddar and egg. Add salt and pepper if you like. Bake for 15-25 minutes or until the eggs are set. Mash the avocado on a plate. Adjust salt and pepper to your taste. Set aside in a bowl. 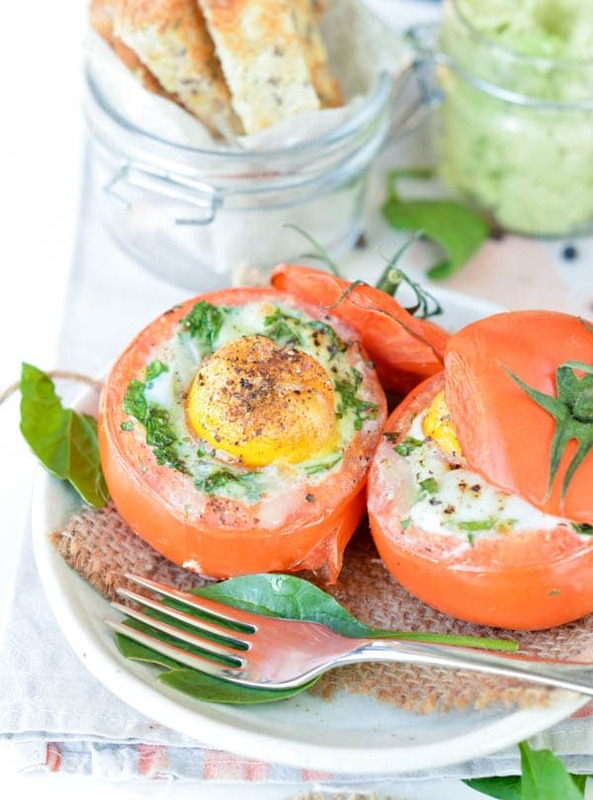 Serve the stuffed tomatoes hot topped with mashed avocado. Tomatoes: make sure you buy large tomatoes that could fit the size of your egg plus the other ingredients. If the tomatoes are too small the egg white will run over the tomato. In New Zealand I bought size 6 eggs - regular size - and medium tomatoes. Make ahead: You can also make those tomato ahead. 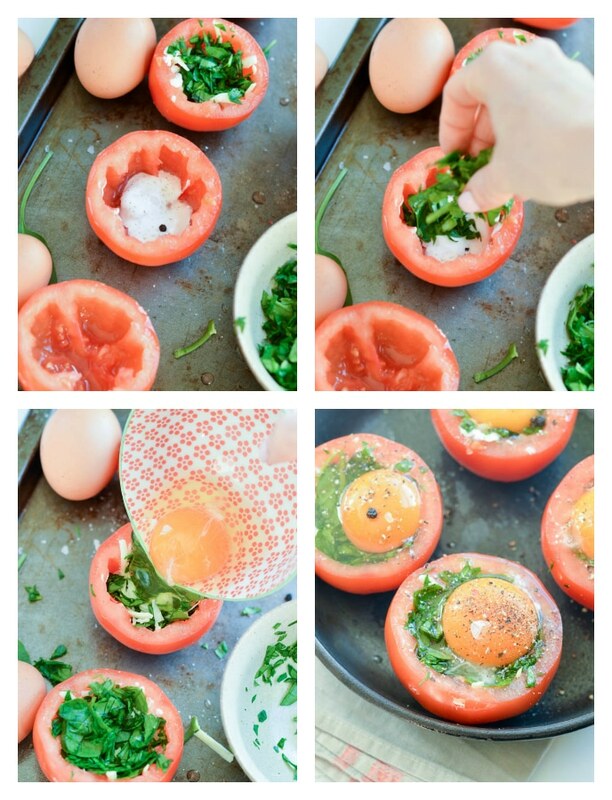 Store them in the fridge overnight and crack your egg in the tomato hole in the morning before baking them. This recipe makes 4 egg stuffed tmatoes with spinach. Nutrition panel is for one stuffed tomato WITHOUT the mashed avocado. This recipe makes 4 egg stuffed tmatoes with spinach. Nutrition panel is for one stuffed tomato WITH the mashed avocado. I just found your website and am excited about all the great recipes I’ve come across! I thought that I would try this stuffed tomato recipe tonight for a quick, wholesome dinner, but I’m noticing that while you mention adding finely chopped spinach in the directions, you don’t have it listed in the ingredients. For tonight I will just guess and add a little finely chopped fresh spinach since it will cook when the egg is baking, but I would prefer you to specify. Delish! I added goat cheese, garlic chutney and parsley pesto to the tomato before adding the egg. Topped with infused EVOO….everyone loved it and looked beautiful! That is sounds lovely ! Everything is always better with goat cheese 🙂 Thanks for this lovely comment. XOXO Carine.